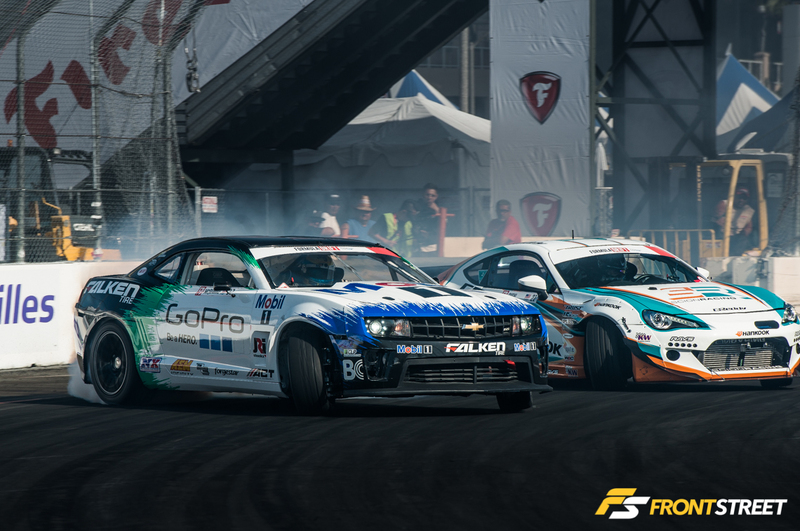 In the relatively short span of 12 years, Formula Drift’s diversity has crossed planes many other tenured racing series have not. 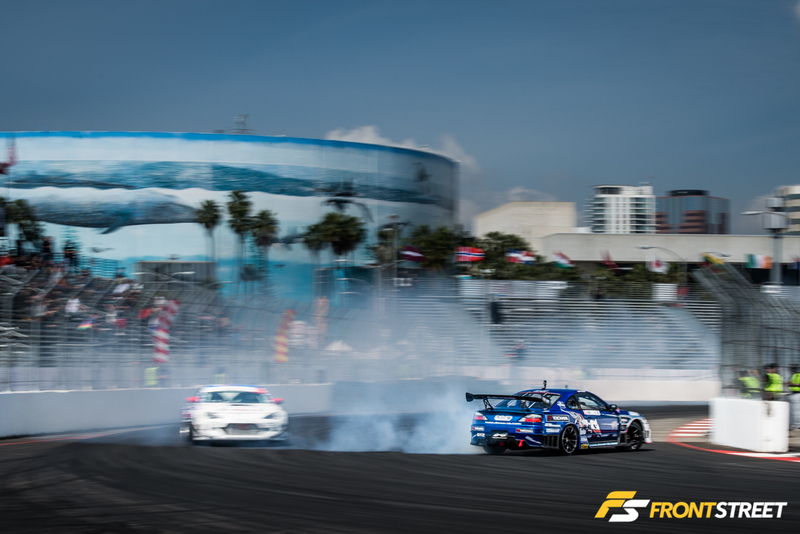 With drivers hailing from numerous overseas countries, engine transplants into every chassis under the sun, and race locations that require air travel. 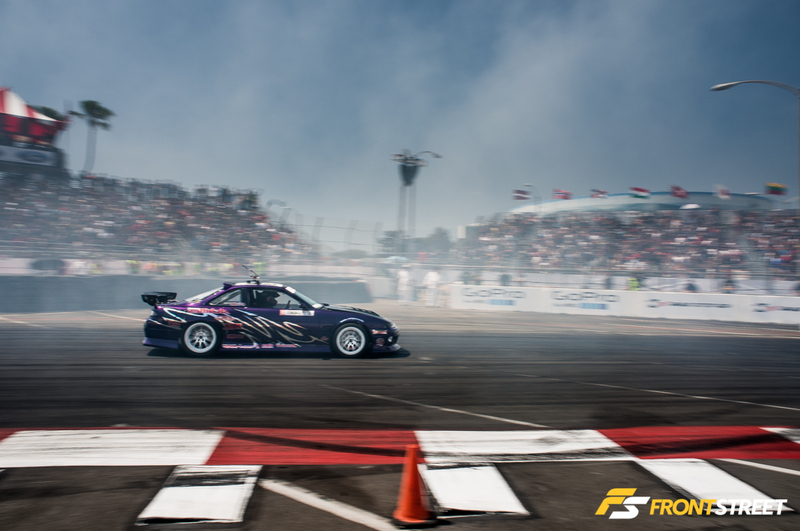 FD consistently draws sell out attendance at each event. 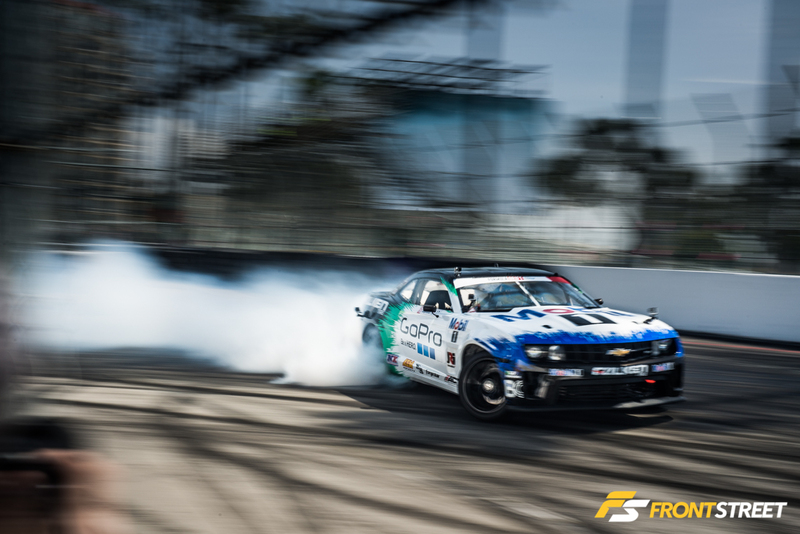 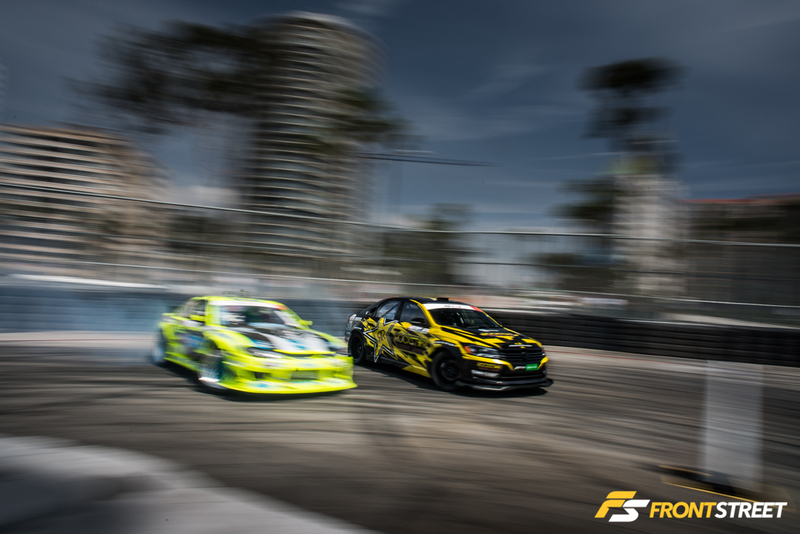 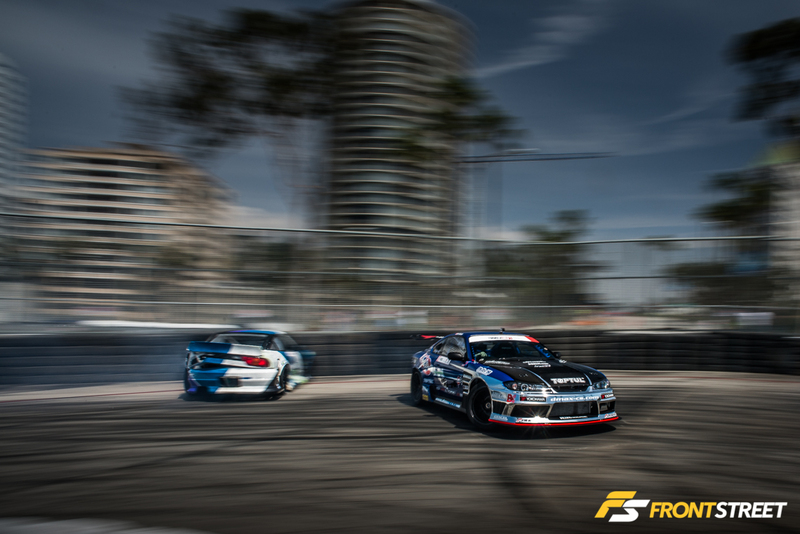 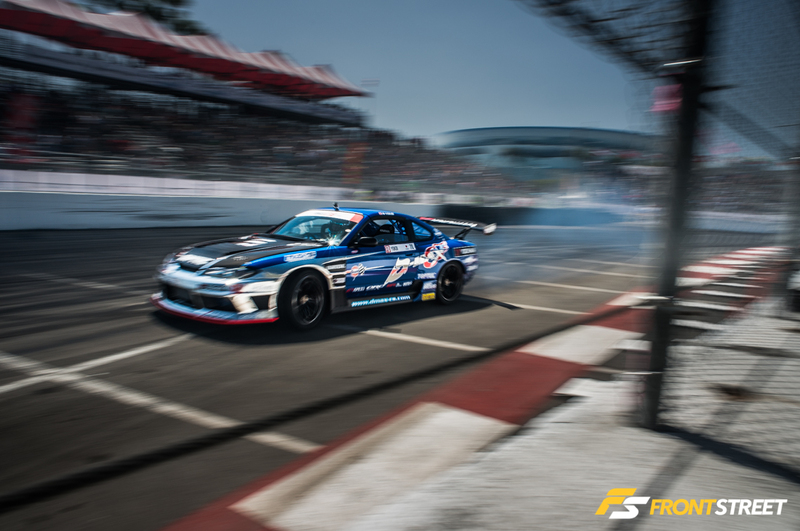 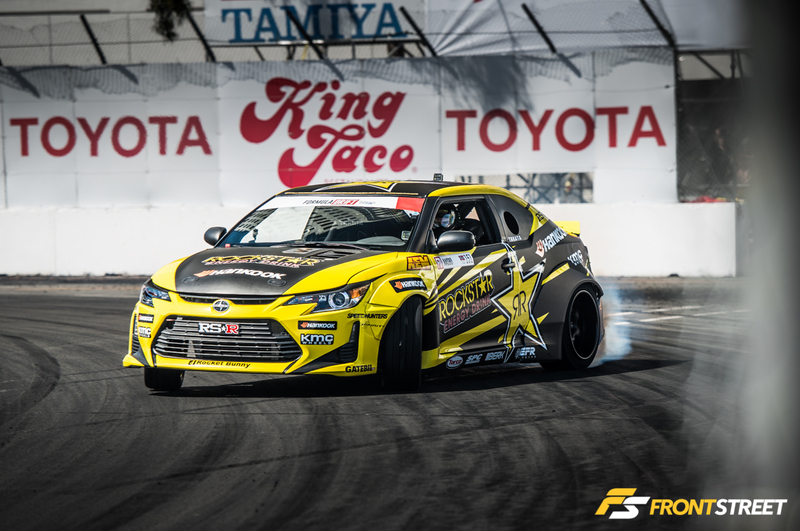 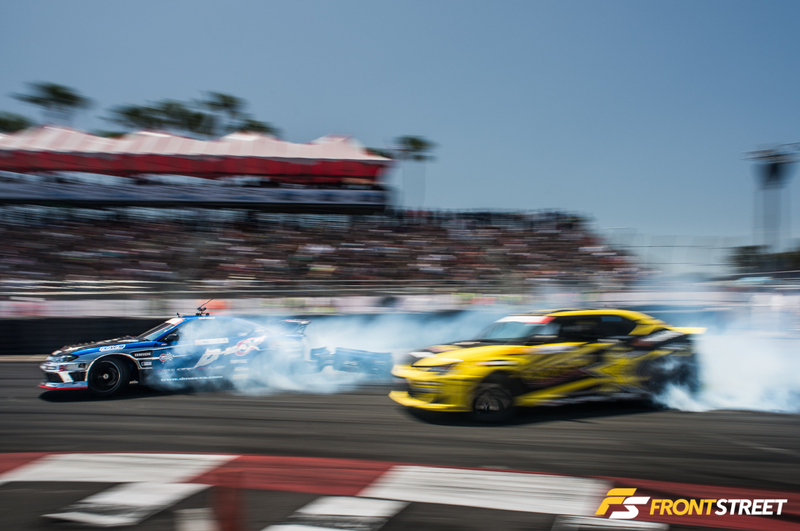 The 40-year-old Long Beach Grand Prix track set in the California city it’s named after has given a home to Formula Drift since 2005. 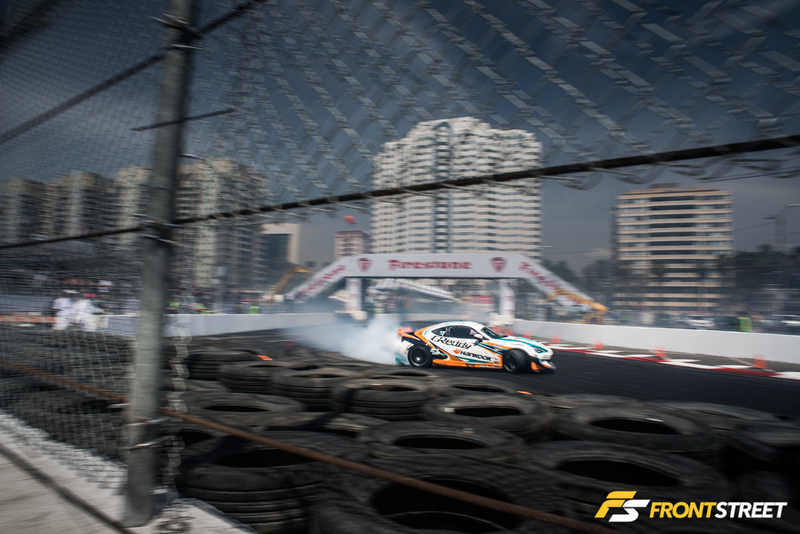 Concrete walls and fencing transform the public roads usually meant for the bustling city, into the fabled track laden with the roar of angry racecars. 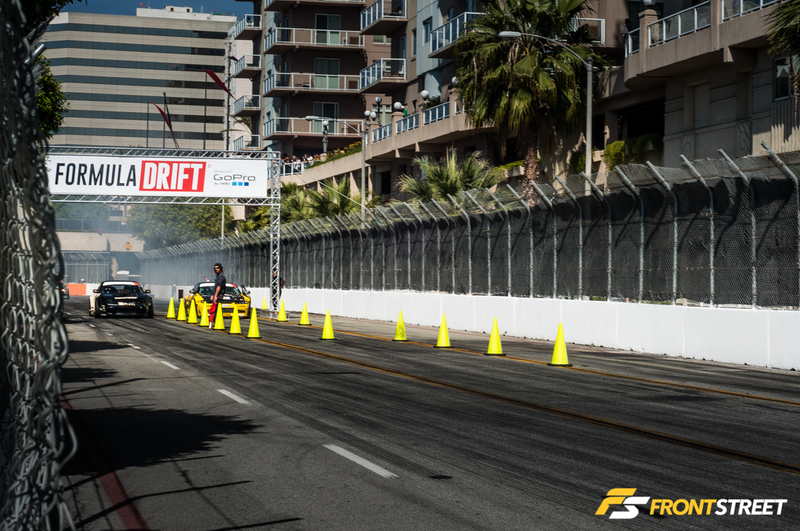 The drift course sees its drivers navigate on the edge of grip from turns 9 through 11 of the full layout. 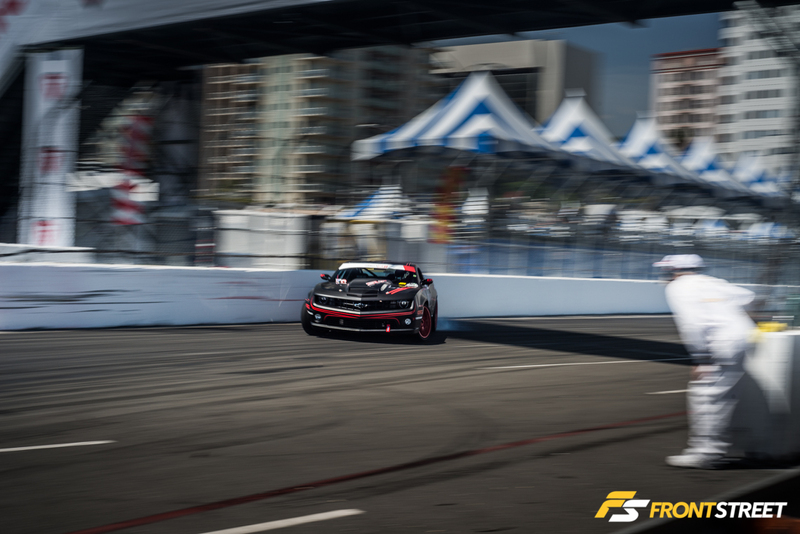 The ocean breeze and nearby harbor create the Monaco-esque atmosphere that made the season opener so highly anticipated in 2015. 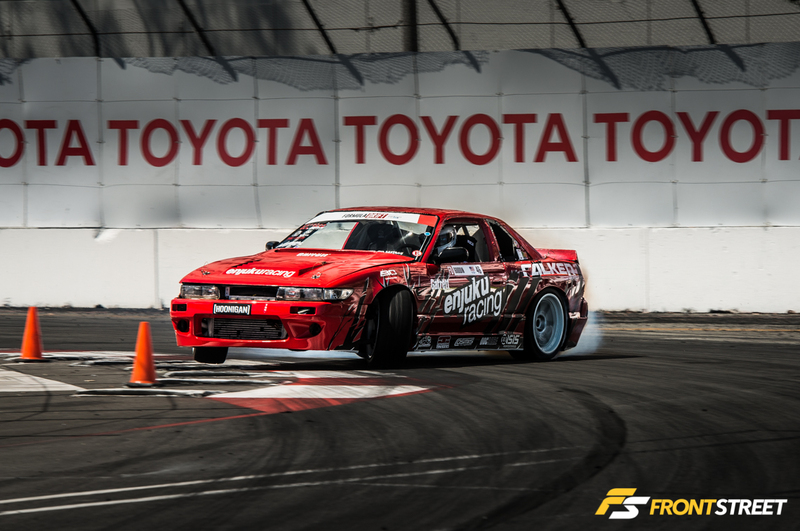 Starting with Friday when Forrest Wang took first place qualifier, after flawless runs all day. 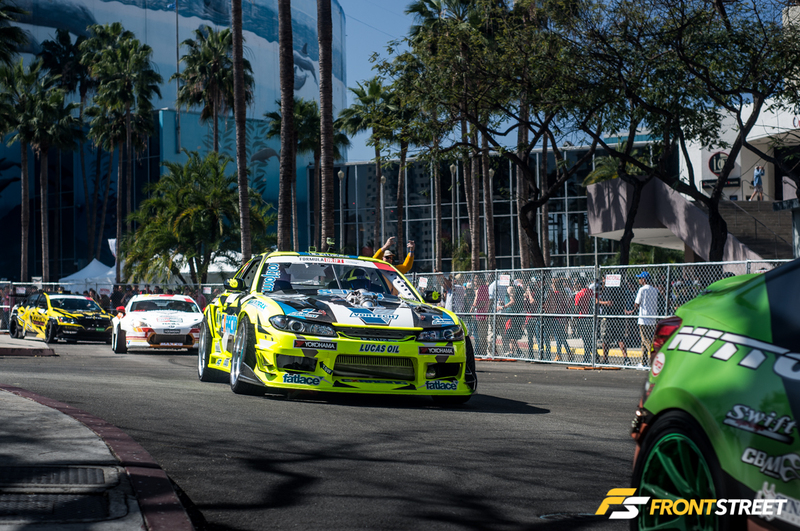 The reverb of his engine’s limiter and tire squealing was only muffled by the grandstand’s reaction to his 2JZ powered S15 Silvia. 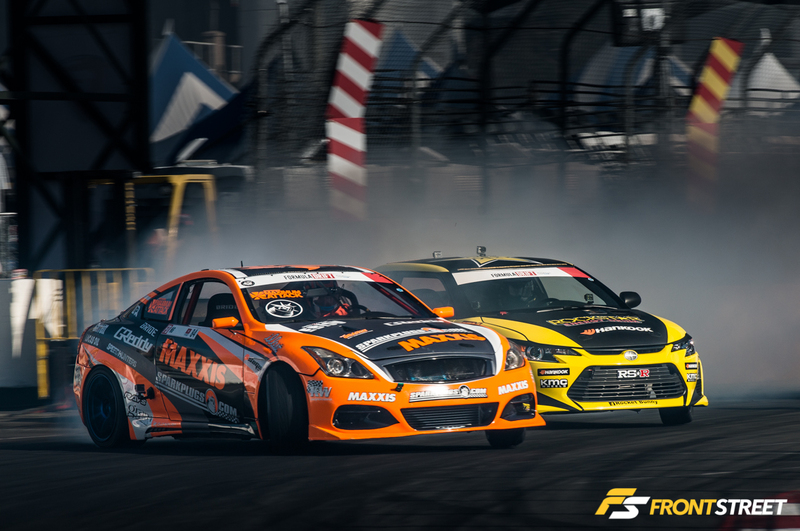 The season opener brought with it several new liveries on familiar cars. 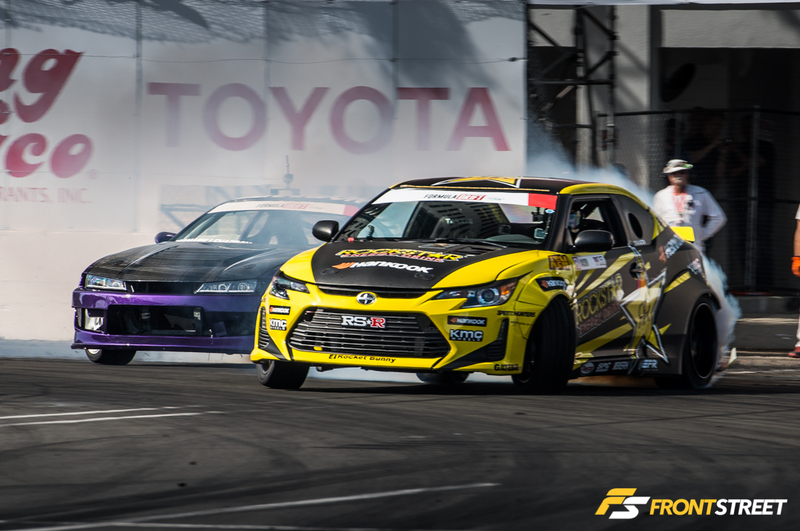 One of the favorites of the crowd was Ryan Tuerck’s vintage Toyota racing livery on his stroked 2JZ FRS. 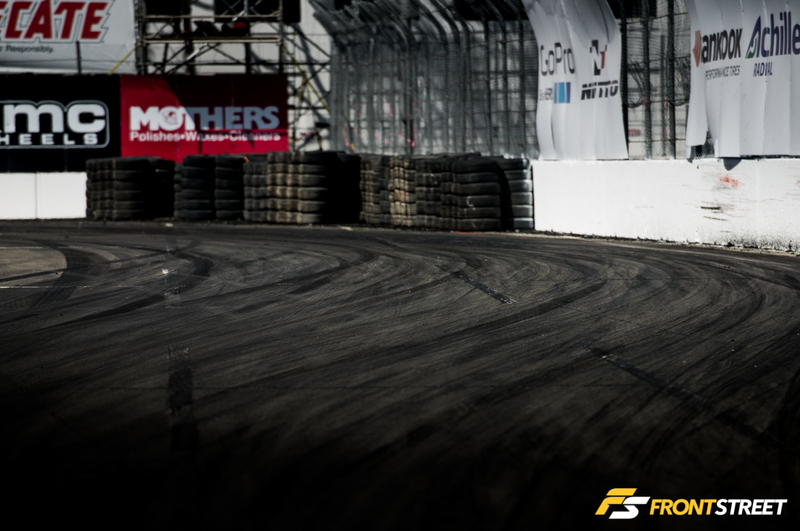 Numerous teams took on new chassis, and new swaps for the upcoming season. 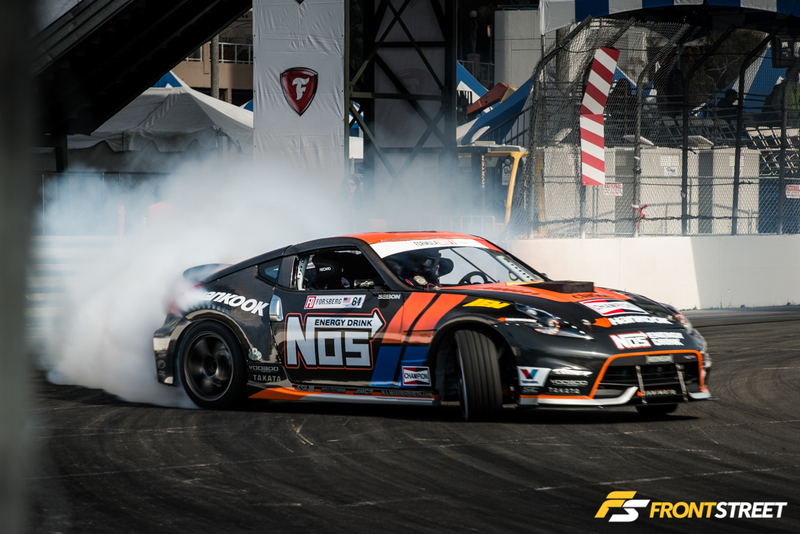 Including Daigo Saito in his VR38DETT powered HKS Nissan GTR. 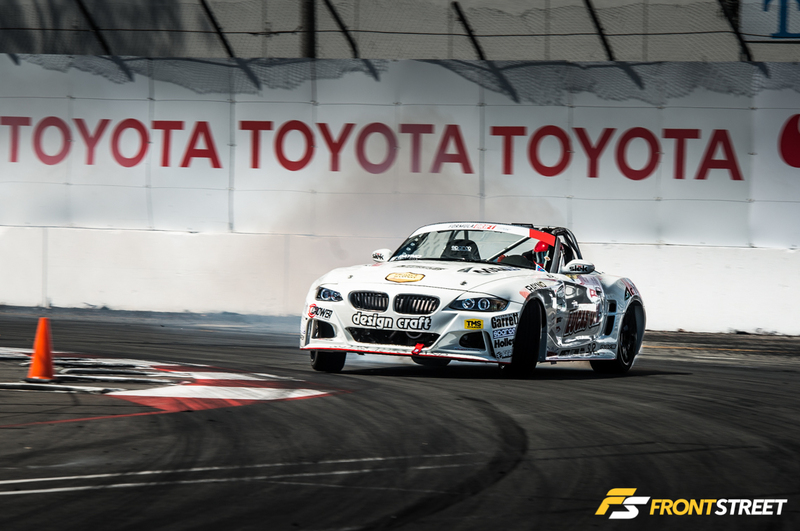 Joon Maeng struggled to qualify in his all new Lucas Oil BMW Z4, with a 900hp 2JZ powerplant. 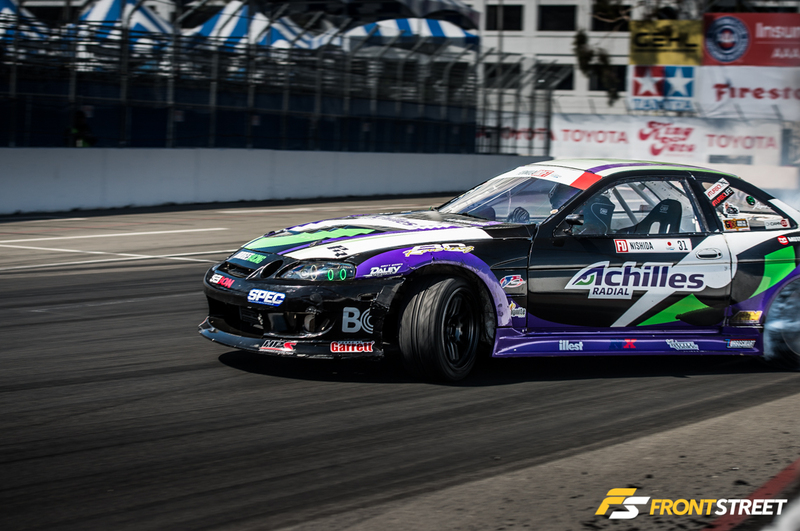 But showed the diverse examples FormulaDrift brings out. 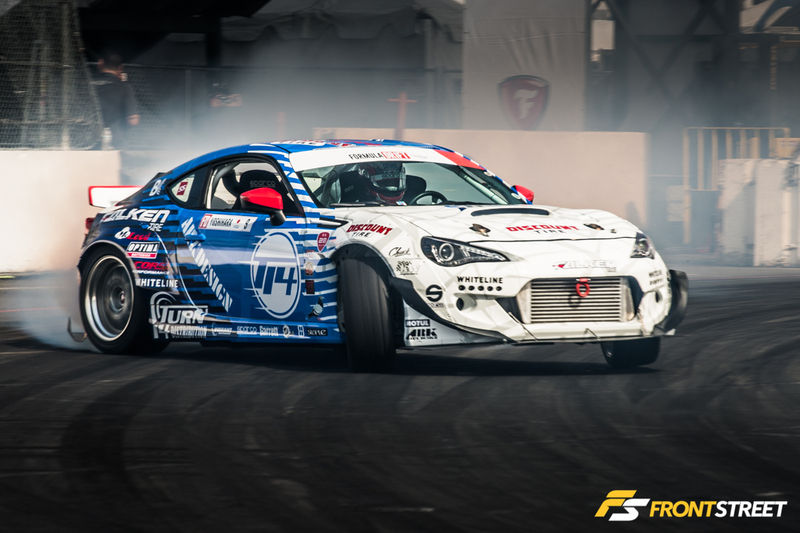 Daijiro Yoshihara returned with more power this season in his Subaru BRZ with Falken and a new title sponsor, Turn 14 Distribution. 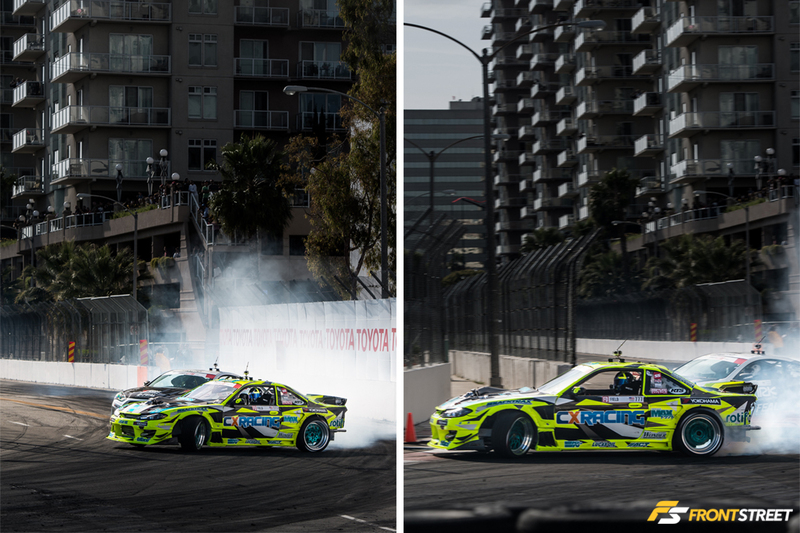 The drivers started Saturday morning with a few practice runs against their fellow competitors. 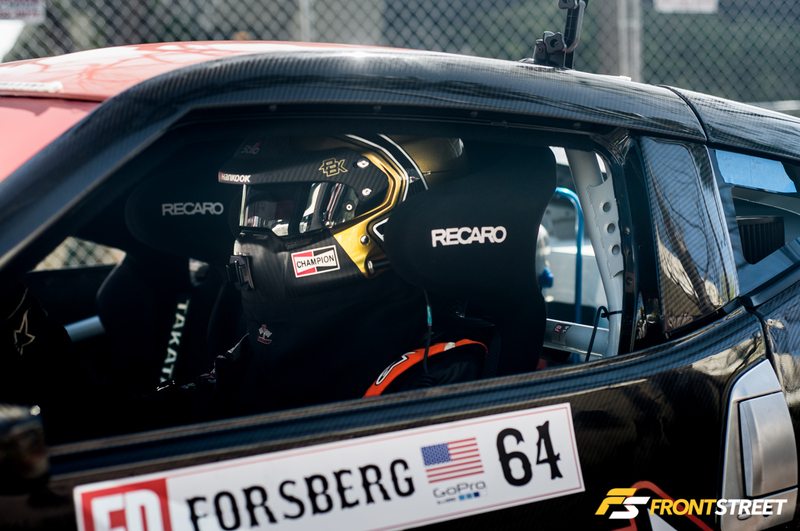 Chris Forsberg had his game face on just before the first round started. 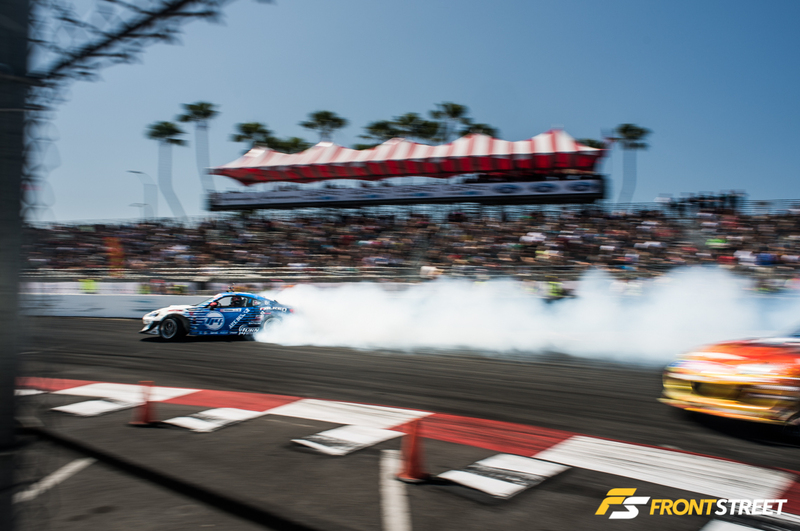 Tyler McQuarrie giving the shaka before ripping through the Long Beach course. 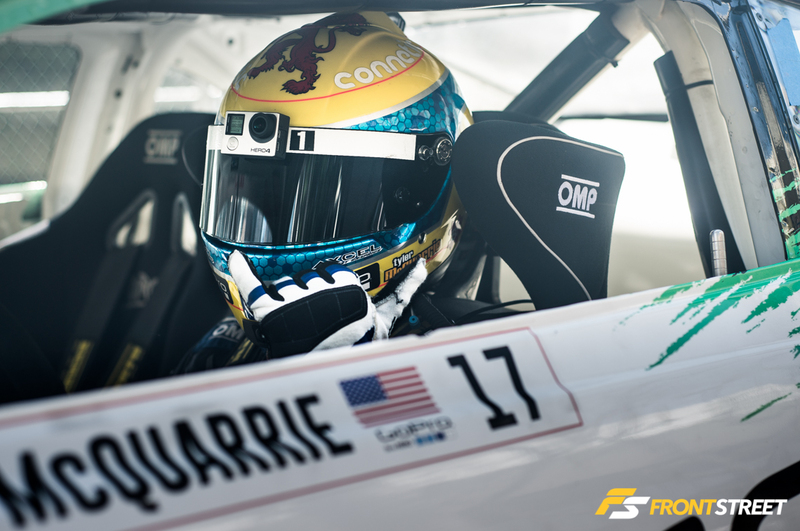 Note the GoPro camera attached to his visor, for a first-person perspective only they could bring you. 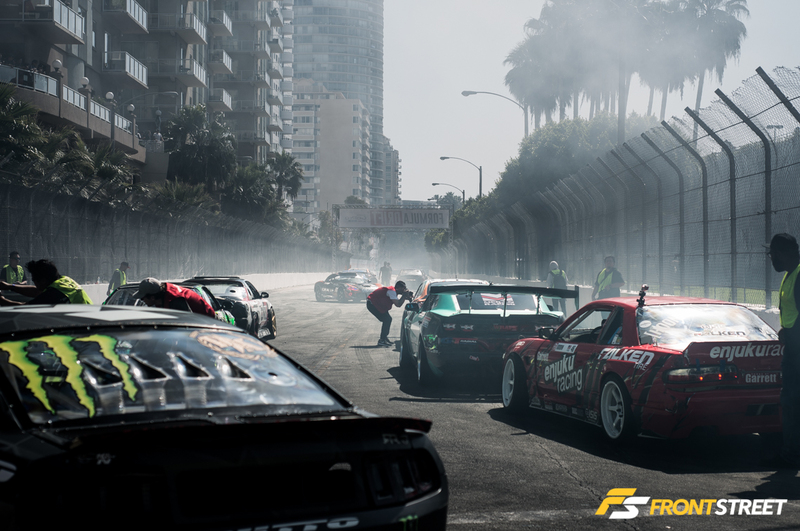 The competition route for this venue started with a roll-in past the crowd at the entrance. 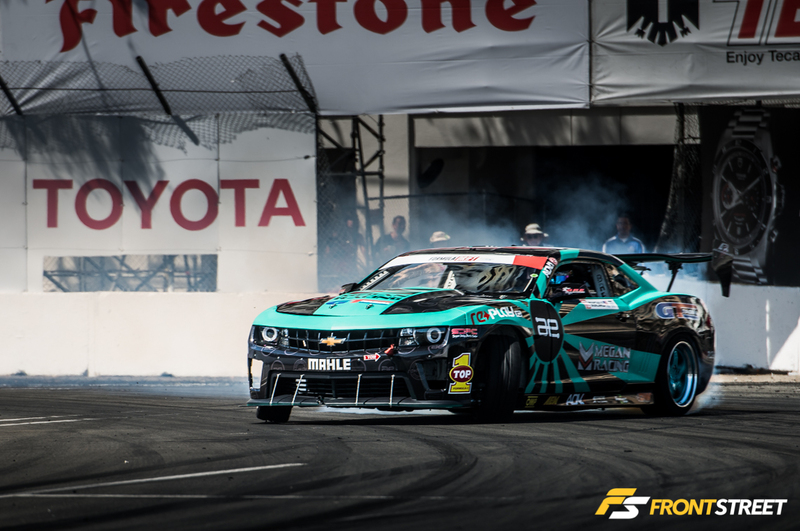 Followed up by the warm-up area, where the drivers shred their tires to new layers of sticky rubber by doing donuts/figure-8’s, or the good ol’ fashioned burnout. 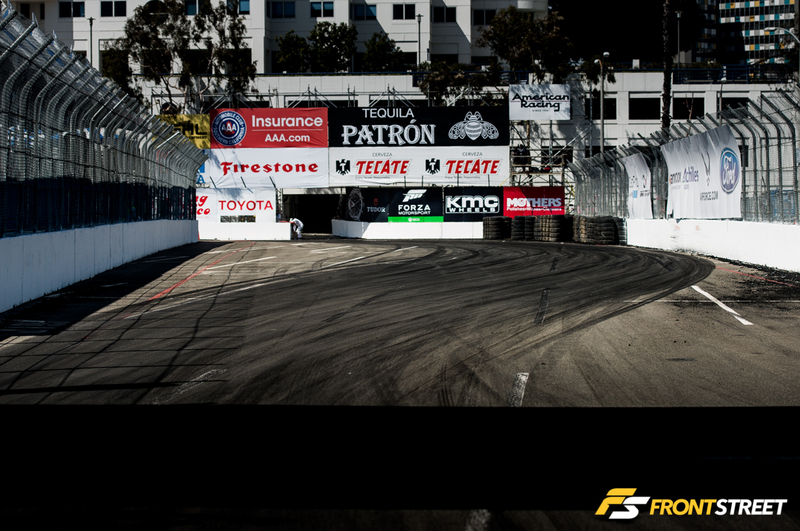 The judged course outline begins on the section of public road usually used as Turn 9 in the Grand Prix course. 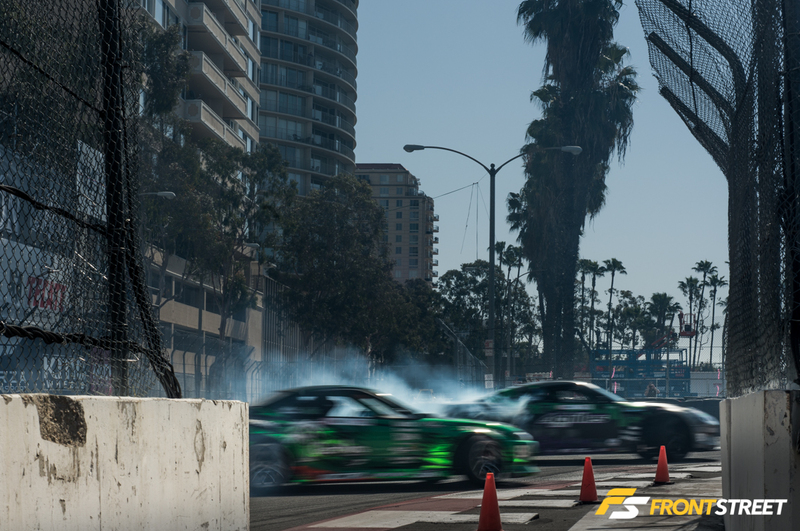 Flowing off this entry and setting up for the wall clipping point under the bridge is crucial. 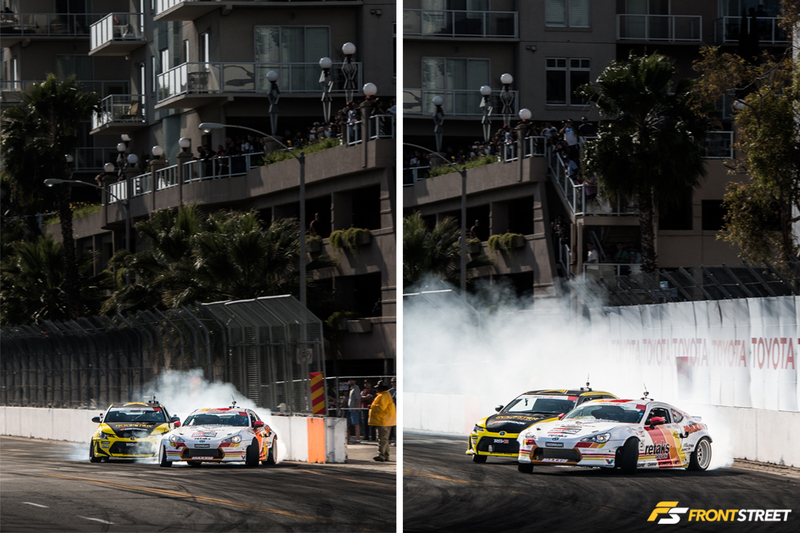 …leading into the final hairpin corner where a complete change of direction is necessary. 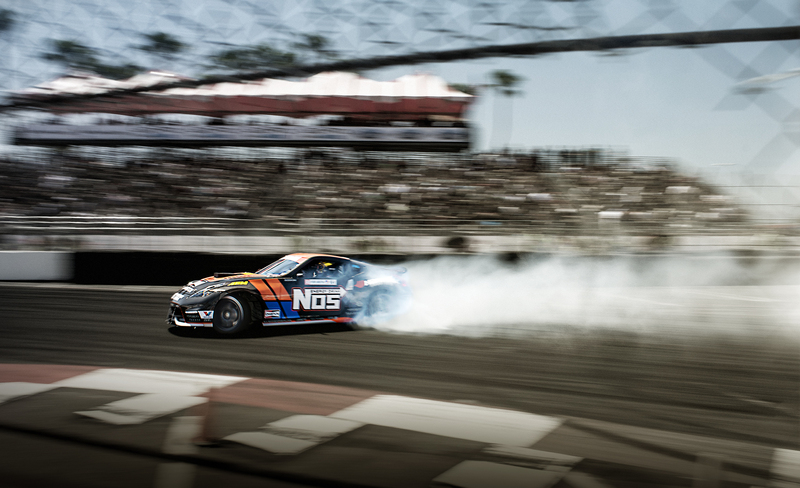 This has a strong chance of going wrong, and the wall claimed victims all day. 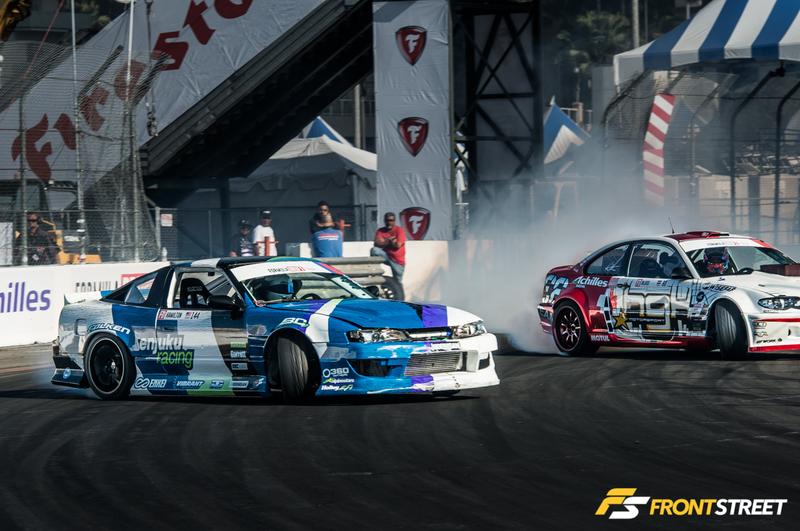 Including Nate Hamilton in his Enjuku Racing S13/4, as Masashi Yokoi pulled away in his D-Max S15 Silvia. 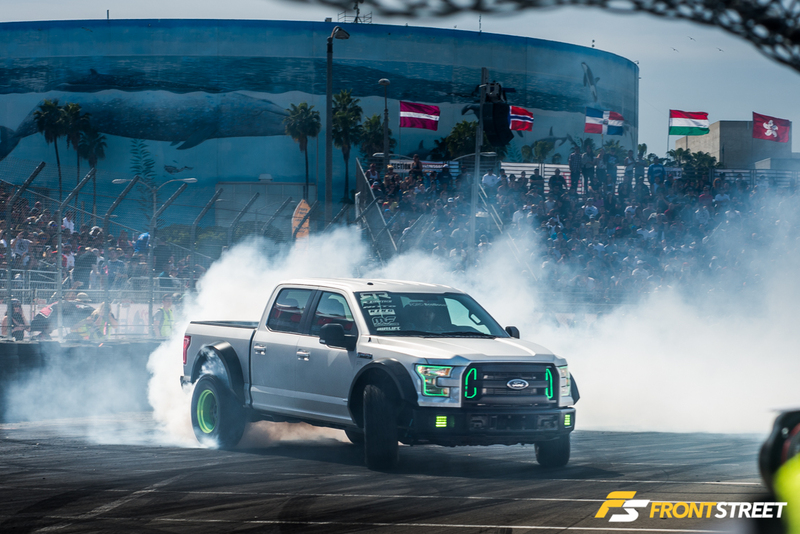 When Vaughn Gittin Jr. brought out his personal Ford Ecoboost F150 RTR, the perspective of a functional truck shifted. 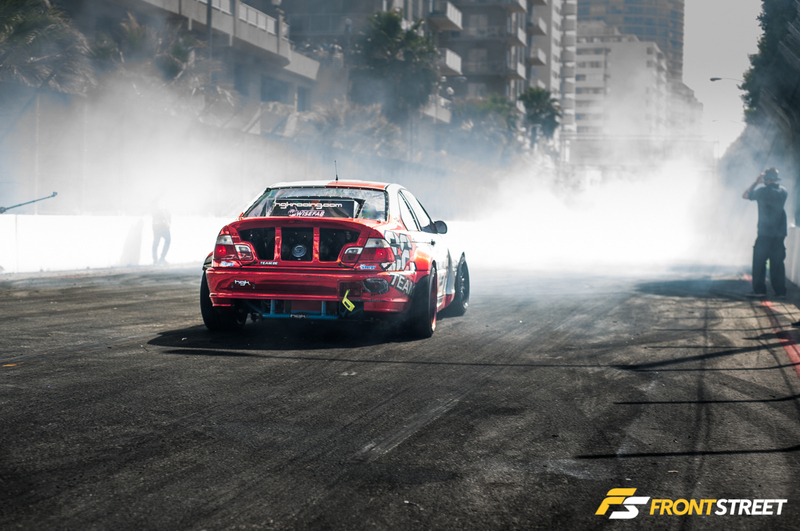 Giving the atmosphere a few more clouds courtesy of some pre-competition showboating for the crowd. 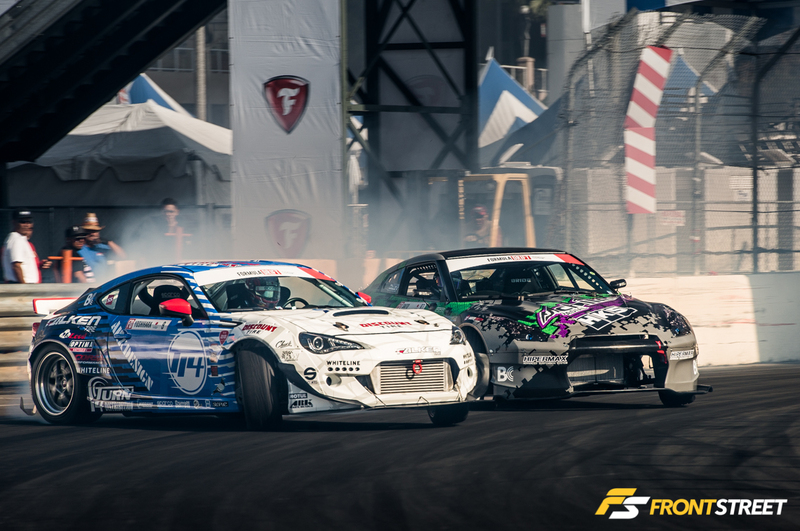 Competition got underway mid-day and saw some close battles which could only be decided by the “One More Time” judging. 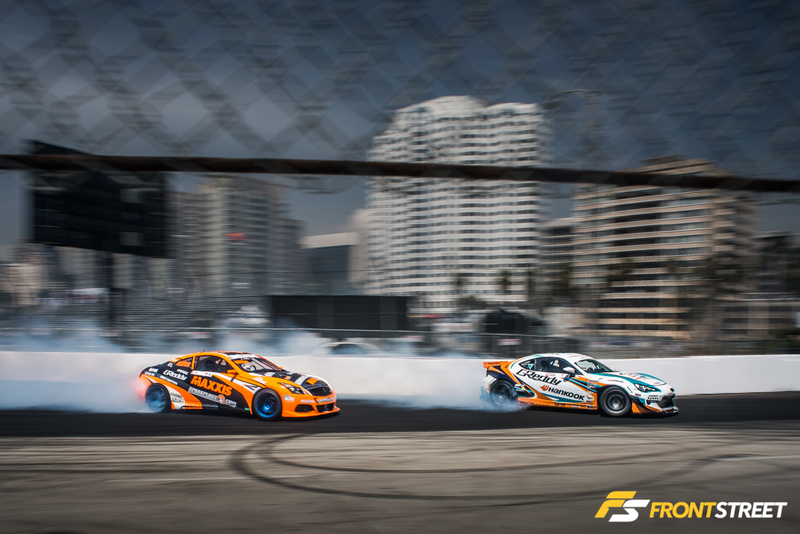 Where the two drivers circle back around the track, and rematch each other to determine a winner by a second set of runs. 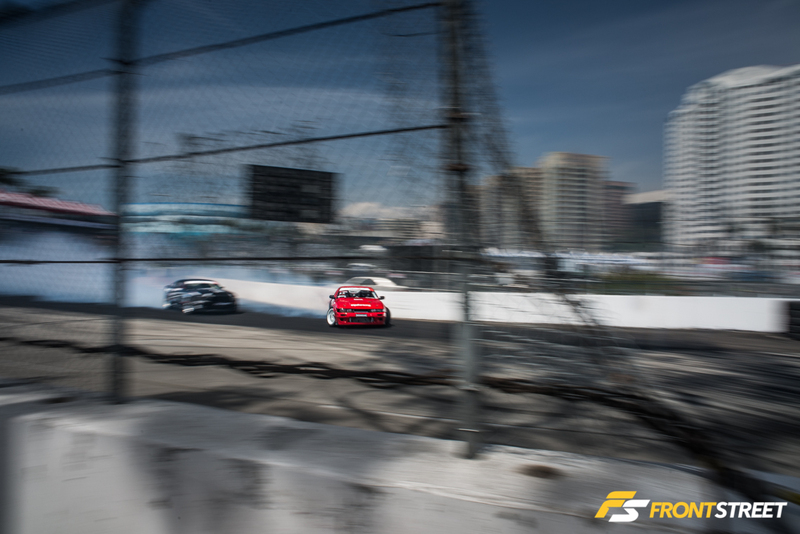 The location amidst the condos overlooking the port makes for such a tranquil background for drifting action. 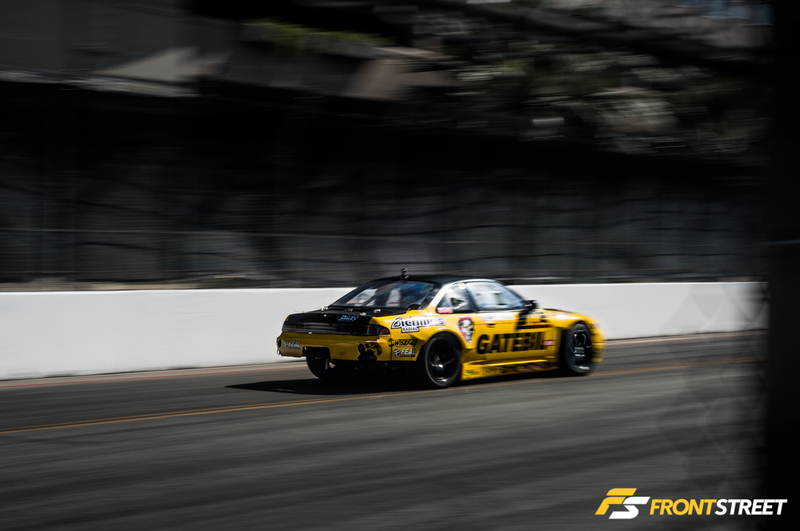 Standing out was Matt Field’s LQ9-swapped CX Racing S14/5. 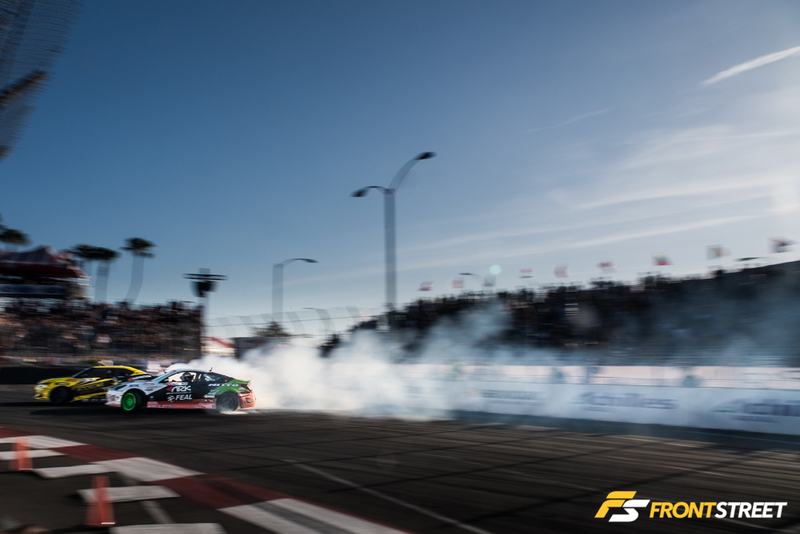 The sun started to set and the early 6pm noise curfew became a possible issue for the FD event being allowed to finish. 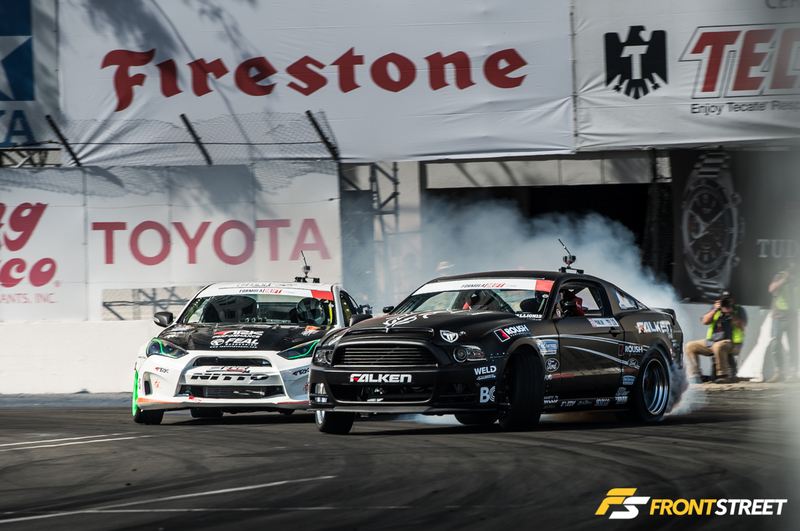 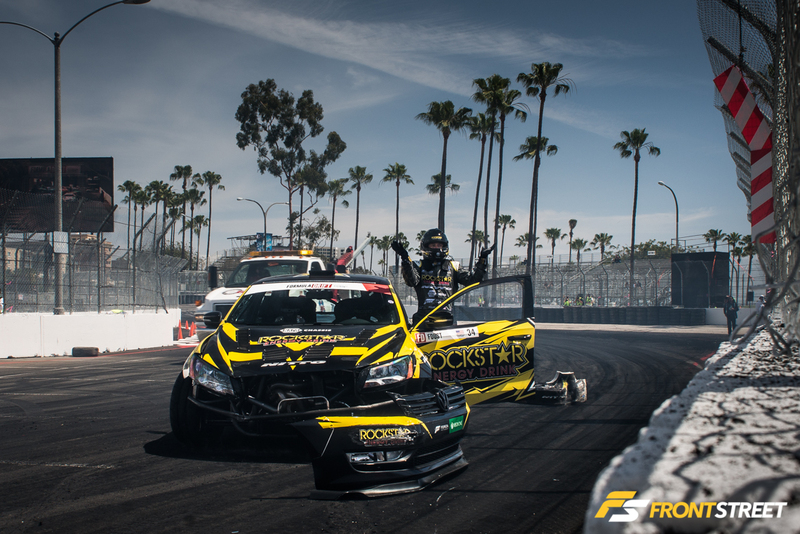 The minutes counted down as the final runs between Fredric Aasbø and Ryan Tuerck took place. 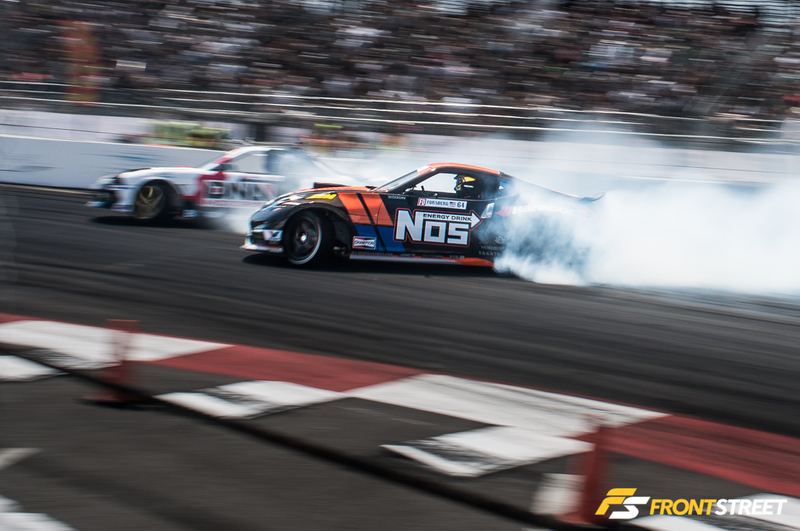 Ultimately being Aasbø’s day, as he edged out Aurimas “Odi” Bakchis for the top spot on the podium. 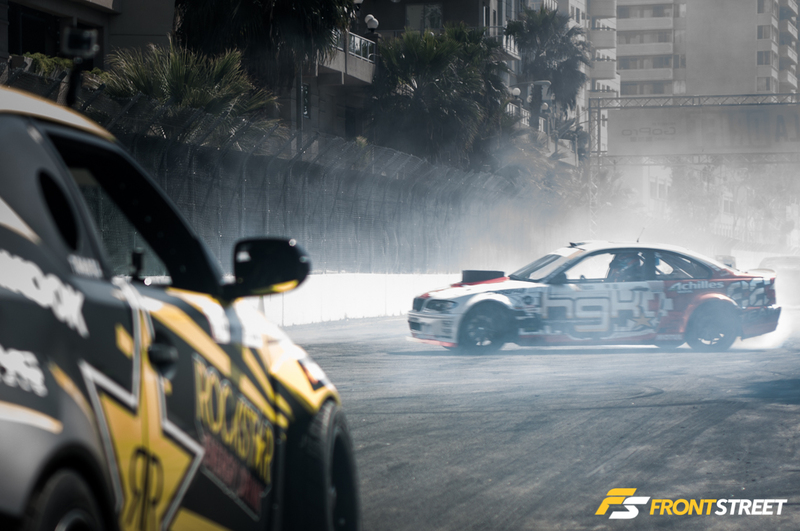 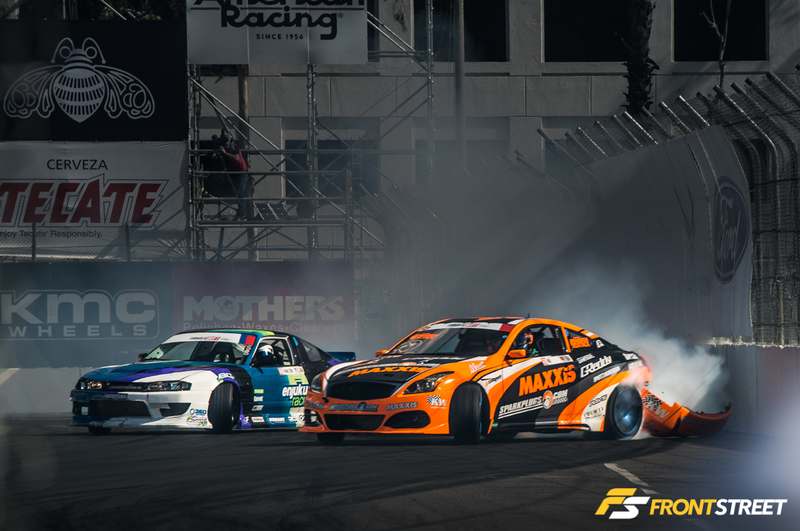 Stay tuned for more Formula Drift coverage throughout the year!